What would a weekend be like without dancing? Good thing you'll never have to find out. With BeeVancity, there is always dancing and a whole lot more. Here's our top picks of the week! Be sure to check out our other posts to see what we've been up to (including attending a HootSuite party). 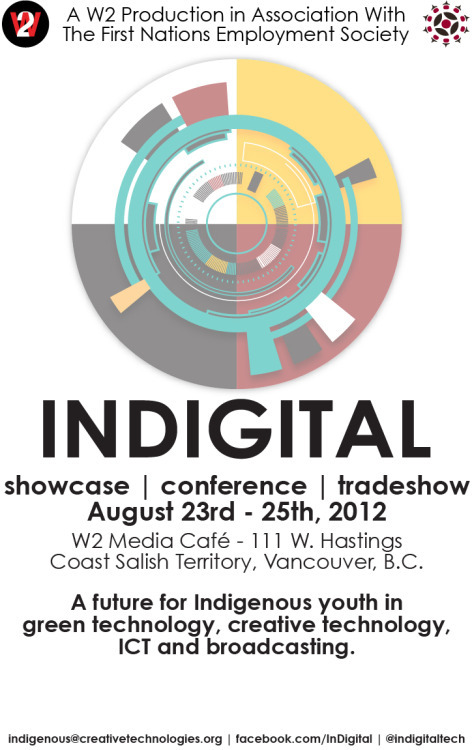 Brought to you by W2 Media Cafe and First Nations Employment Society, Indigital is an innovative four day technological experience that will nurture Indigenous youth to discover their interests in ICT, creative, broadcasting and green-tech technologies.The InDigital Youth Conference on August 25th is open to the public for registration, and will feature panels and workshops from local established and emerging artists, curators, and digital technologists. Come out and dance to some feel good tunes so you forget that the end of summer is near. Enjoy upbeat music from guest DJ, Viceroy, from San Fran, as well as local DJs Pat Lok, Nick Bike, Tyler S Popinov and Uncle Electro. In this contest four teams, each including two artists with differing styles setting their differences aside and combining their skills, strokes and colors to complete a painting on a chosen theme. And they only have 80 minutes to do it! What is the theme? Summer Love! The colorful results will also be auctioned off along with paintings from previous competitions. In honor of VQFF's centerpiece gala film, MIA, they're throwing a party! You will be in sensory overload as you are tantalized with Argentinian wines and snacks, DJ Cho Cha spinning beats and a couple of drag superstars partying all night long. Time to be that unicorn you've always wanted to be. Vancouver’s biggest costume party is set to descend on UBC this weekend – three straight days of costume competitions, SFX makeup battles, workshops and themed dance parties after dark. Don't have a ticket for the Yeasayer show at the Malkin Bowl? No worries, come join a group of fun loving individuals for a picnic and some eavesdropping. If you feel guilty for "stealing" their entertainment, buy an album! You are all invited to the book launch of "Power of Youth", published by the Canadian Centre for Policy Alternatives. Hear from incredible young activists who contributed articles to the book, and take part in an intergenerational dialogue about activism and the future of the progressive movement.